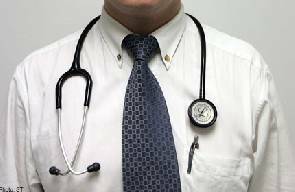 Doctor snubs dying patient for church service - BlogIT with OLIVIA!!! Mother of a nine-year-old patient who was driven out of the Agona Swedru Government Hospital in the Central region Ghana , called out to Ghana Ministry of Health to investigate what she describes as 'a pure dereliction of duty perpetuated at the health facility. The mother, Lily De Sossa was compelled to drive her daughter to Kaneshie Polyclinic in Accra [a journey of 72kms] to save her life as she was in a critical condition. Madam De Sossa said the doctor on duty turned her away with excuse that he was attending a church service. The doctor, who is yet to be identified, ordered her to wait with her frail daughter until he returns from church. Reacting to the concerns, a senior doctor at the hospital, Dr. Apetorgbor Dzodzogbe told this reporter that he would not speak to the issue and advised Madam De Sossa to channel her grievances to the facility via the Complaint Unit for action .